The first book I finished this weekend was a beautiful autobiography of German Nobel-Prize-winning author Günter Grass. The title, Peeling the Onion, is a running metaphor for peeling back the layers of memory, gradually, carefully, taking care not to cut too deep too soon and unleash withheld tears. It is popularly considered a confessional account of Grass's entry into the Waffen-SS, the Nazi military wing. It follows him through his days as an ex-Nazi prisoner of war and the later years as a sculptor and an artist, and how these life experiences influenced his writing and peace-time politics. To start with, let me just say I have read nothing by Grass and not a lot about him. And yet, I knew this - he was the voice of post-war Germany, their self-appointed moral compass, and the man who said, "it is a citizen's first duty to not keep quiet." And yet it took Grass so many years to break his silence. This book caused quite a stir when it was published, precisely because of the irony of its revelation; the fact that Germany's so-called conscience-figure had been a willing believer in the Third Reich. This was why I was looking forward to reading the book. I wanted to read the 'confession of guilt', make sense of it, the scandal it caused; it could be a non-fictional version of Miller's The Crucible, and with this expectation, I was setting myself up for disappointment. I went in expecting a very different book. Peeling the Onion is not Grass's daring confession about his part in the Waffen-SS. Guilt is a major theme in the book, and war played a major role in his life - but not in the way you'd expect or want it to be. The controversy, in hindsight, makes as little sense as accusing To Kill A Mockingbird by Harper Lee of racist talk or trying to ban Fahrenheit 451 by Ray Bradbury. The controversy takes a cursory glance at the book and misses the subtext. Grass was not a hypocrite, for the man demanding and expecting honesty from fellow men did not carry himself on a high horse. This book shows, in fact, that he was rather a man who had spent the better part of his life struggling with remorse for not having done just that - for not having had the courage to speak up. For not asking, "Why?" The narrator of a book is ideally a sympathetic character. This, Grass is not. Yet, it is perfectly possible to look past that for the book has a lot to offer. "When shortly after my eleventh birthday synagogues in Danzig and elsewhere were set aflame and Jewish merchants' shop windows shattered, I took no part, yet I was very much a curious spectator. I simply stood by and observed, and was, at most, surprised. No matter how zealously I rummage through the foliage of my memory, I can find nothing in my favour. My childhood years seem to have been completely untroubled by doubt. No, I was a pushover, always game for everything that the times, which called themselves - exhilaratedly and exhilaratingly - modern, had to offer." Grass is unerringly honest. And this honesty is disconcerting to read, as in the chapter 'His name was WEDONTDOTHAT'. Grass tells us about a spirited blue-eyed blonde boy, a fellow soldier in the Luftwaffe, who would pointedly refuse to hold any weapon because it was un-German. "We don't do that," he would say, no matter how and how often he was punished for it, and "Wedontdothat" became his name; Grass talks about how relieved they were when, one day, he disappeared from te camp and with him, the pricking doubt he put in the rest of their minds finally vanished. Grass didn't care where he had gone, though they all knew. It was difficult to take Grass's brusque honesty in a stride at such times. I had to take periodic breaks from the book as it was too emotionally charged to read at one go. Of course, the infamous Waffen-SS is only a minor feature in the 500-page book. One-fourth of it, perhaps. A large quarter of the book is about hunger, and how Grass spent most of his life satisfying one hunger after the other, hunger of the stomach during war-time, of the flesh as a youth and of the mind. How hunger frequently dictated the course his life would take. Grass details his experience as a prisoner of war at the age of eighteen. Injured, in mind and body, yet never having shot a bullet himself. Tells us how it was to meet Jews for the first time since the war, how it was to learn about the horrors of the concentration camp and how the ex-soldiers would refuse to believe that it existed. He talks about listening to late night arguments on politics and coming to terms with his ignorance and indifference. He details later learning what happened to his family "when the Russians came." How the war changed his mother, who never told him what really went on when Danzig, the hometown, was raided. How it broke his sister's spirit. It is a cinema-reel of atrocities and the clear sun-lit reality of it all makes it so difficult to tell black from white. The supposed controversy of Grass's revelation has long ceased to matter at this point. 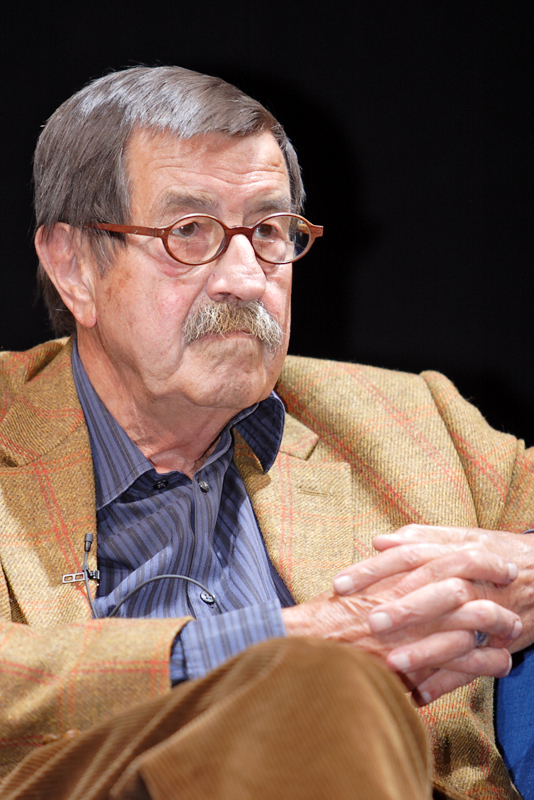 Günter Grass was a sculptor. This, I did not know at all. He had been an art enthusiast as a child and artist was one of the things he wanted to grow up to be. A waning half of the book is about his career as a sculptor, the women in his life during this time. Amidst all the women (and his children) in his life, this book details only one of his marriages, to Anna Schwarz, the dancer. His second wife Ute makes guest appearances in his travels. The various characters of his numerous books start taking shape now, inspiration flowing in from his war memories, and we finally begin to learn a little something about Günter Grass, the writer. He used to stand when he wrote! What a weirdly inconsequential thing to discover, yet it has stuck, maybe because it is so random - it was a habit he picked up as a sculptor, he wrote at his stand-up desk. He was left-handed, and talks as though he is constantly aware of his left-handedness; and of course he is, so am I. (Aren't right-handers constantly aware of their right-handedness? Must be, because so many show surprise when I casually raise my left hand to do something.) He also dwells on his transformation from a total non-smoker who'd use cigarettes as a favourite barter in his prison days to the young artist who smoked for careful pretense until it became an incorrigible habit. Often he drifts into the third person talking not of himself but a boy and I cannot help but wonder, is he making it impersonal for our sake or his own? But, of course, he has already told me that. I should know by now... nothing escapes him, least of all his own failings. The very first sentence of the book reads - "Today, as in years past, the temptation to camouflage oneself in the third person remains great." It cannot be easy to fashion a tangible narrative out of wisps of memory. Moreover, to convert ones past into something of interest to another. The writing does not possess an inch of self-importance or flattery, nor does he ever put on an air of fake modesty. Quite possibly because it took me so long to read it, but also because of how far and deep it extended, I neared the end of the book with the conclusive impression that I had experienced a lifetime - a long, long trek, and I was the mental equivalent of out-of-breath. Superb commentary on this book. I had heard about it from several sources. One thing that I get from your review is that it seems different and it is presented in an unexpected way. So few books seem to do that. I would like to give this a try someday. Thanks, Brian. I hope you do. It's a dense book, hence the long review, but it is worth the time.